Lovely views of the lake and sunny barbeques at the end of a day on the balcony. The chalet is all on one level and the valley side location with tall leafy trees growing up from below creates a lovely 'treehouse' feel. French doors in the lounge open right out to let in the fresh air whilst inside is cosy with a wood burner effect electric fire. Relax after enjoying the Snowdonia National Park in this homely chalet at Glan Gwna within walking distance of the village of Caeathro, 2 mls from Caernarfon. The chalet offers a smart walk-in shower which makes it very convenient. Glan Gwna is a select holiday retreat in the wooded grounds of a country house with an outdoor swimming pool and restaurant for guests (open in the summer only). The new Welsh Highland steam train station by Caernarfon castle is only a short 2 mile drive, Llanberis and the other little train up Snowdon is only 6 miles away and the award winning sandy beach at Dinas Dinlle is 8ml. This is a very central situation which is ideal for all, couples in particular enjoy the peace and tranquility of the park. Caernarfon has interesting restaurants within the town walls, hidden taverns in the narrow streets, a harbour with boat trips to see the isle of Anglesey. A convenient location for visiting Snowdonia, north Wales coast and Anglesey. 2 BEDROOMS: 1 Double bedroom and 1 Single bedroom with pull out single (2' 6" suitable for a small child). Bed linen provided. Please bring your own towels & tea towels. The bedrooms are compact. there is no room for a cot in the double room only in the single room if the pull out bed is not used. SHOWER ROOM: Shower room with an electric shower and WC. LOUNGE/DINER: TV, DVD, electric fire and French doors leading onto a large balcony with patio table and chairs. KITCHEN: Attractive kitchen with electric hob and oven, fridge and microwave. PET: Maximum 2 small dogs or 1 large dog. Mini-break rules at this cottage: A mini-break is a holiday for less than a week and/or may start on a day which isn't the normal changeover day (Saturday). This property owner will accept mini-breaks at anytime outside of school holidays. 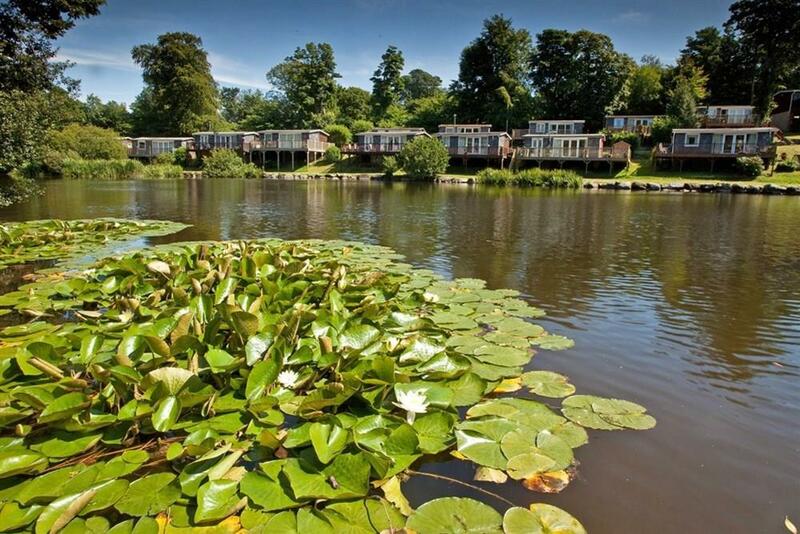 Trip Advisor Review: "The park itself is very pretty and well kept, mostly wooded with gardens, a river, lake and weir. It is very dog friendly, and just the grounds themselves allow for a very pleasant walk each morning. This is a quieter type of park, ideal for relaxing and families." Mr & Mrs P: "What a lovely chalet! Nice and modern, perfect for exploring all that North Wales has to offer. There are some lovely places to have lunch & dinner in Caernarfon. The Isle of Anglesey is just beautiful to visit. Betws- Y - Coed is perfect; picture postcard. We climbed Mount Snowdon, which was a challenge but well worth doing." The W Family: "The Chalet is beautiful and modern, really enjoyed the view. Thanks for a lovely holiday. We will be back." Mr & Mrs H: "Lovely neat chalet, one of the nicest sites we've been to. Had a great holiday. We had forgotten just how beautiful this part of the country is. Many thanks for a lovely holiday and a lovely chalet." Mr & Mrs C: "Found chalet on the internet and we were not disappointed! The chalet is very easy to live in and every need provided for. Brilliant position. Despite the rain we had a super week. We will be back!" The Williams Family: "Fantastic chalet with amazing view across the lake. Lovely modern decor inside and on a pleasant site. Wonderful, friendly and helpful owners who go out of their way to accommodate us! Even our 16 year old son (hard to please) said it was the best ever! On that note....we will be back! Thank you"
Mr N: "Very impressed with the site..."
"A cosy chalet with lake views on this country park in Snowdonia. Comfortable lounge area. Double and twin bedrooms and modern shower room. The kitchen is well equipped with very good units and appliances."